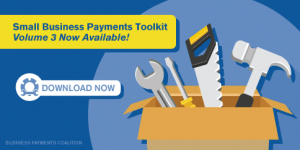 The Business Payments Coalition originally released the Small Business Payments Toolkit (PDF) in April of 2015 to further encourage the adoption of electronic business-to-business payments and remittance information exchanges by small businesses. Each volume builds upon the content released in previous volumes with new content and updates made to address the evolving nature of the payments system and the needs of small businesses. Volume 3 (PDF) is reorganized to provide the information you need in easy to find sections, and includes new and updated payments information addressing key topics relevant to small businesses. Don’t miss out on all this valuable information! Financial institutions, consultants, small businesses and anyone else interested in learning more about payments should download this free resource (PDF) today.